Team Suzuki Press Office – July 26. Dominique Méliand has been the driving force as Team Manager for the Suzuki Endurance Racing Team and has guided the team to a total of 15 EWC Championship titles from 1983 to 2016. 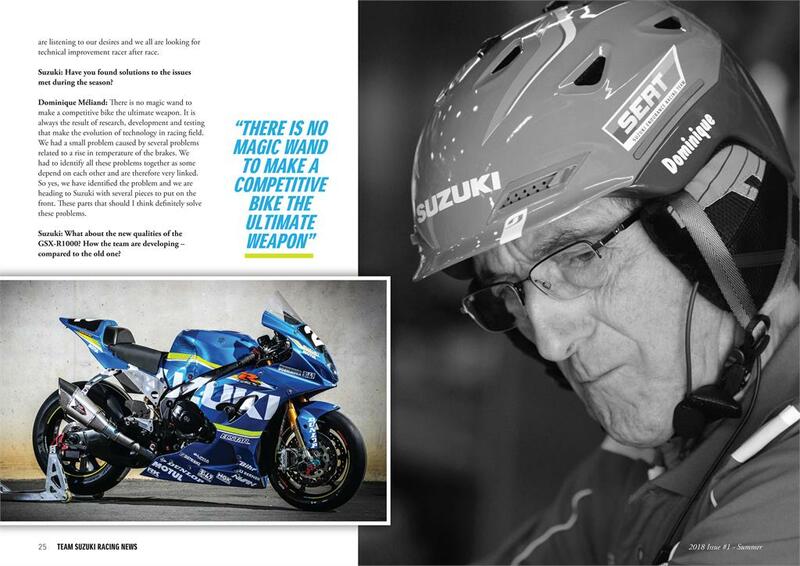 Here, he talks about the season developing the new Suzuki GSX-R1000 in the latest issue of Team Suzuki Racing Magazine ahead of this weekend’s fifth and final round, the Suzuka 8 Hours in Japan on Sunday, July 29th. What is your overview of the season so far? Dominique Méliand: The 2017/ 2018 season has been a challenging one for the SERT. The setting-up and development of a racing bike is not easy, especially in Endurance and we must identify many things to make this bike flawless. We have a fabulous “tool” and surely one of the most powerful ones. We proved it during the 8 Hours of Oschersleben with a great start and Gregg’s pace at the beginning of the race. The crash of Vincent stopped the “Suzuki Bullet”. Following this crash, we knew and effective repair in the pits by the whole team and new attack of the squad to go up, from the last position to the 10th place in the final ranking. Disappointed but not shot. How’s Gregg Black fitting into the team (as he’s putting-in lap-times as fast as Vincent and Etienne)? Dominique Méliand: I have already watched and studied the behaviour of Gregg while he was a riding within the Junior Team Le Mans Sud Suzuki. He was fiery with this desire to do better, to make his team climb the highest step of the podium. He knew how to listen, he learned Endurance, this so complicated discipline. Today he is a confirmed rider, fast and strong both in the “head” and physically. So how not to “adopt” such a pilot who stays tuned to his technical team and who knows how to bring his experience and ability to lead the results of the Team to the Top? What’s news about setting-up and improvement of this very new GSX-R1000? Dominique Méliand: Yes, we are thirsty for development. All the team, from the cook to the technicians, without forgetting the drivers, has this deep desire to always do better. For all these “desires” we are fully served by the Racing department of Suzuki Japan that is doing its best to keep our bike on top and more. They are listening to our desires and we all are looking for technical improvement racer after race. Have you found solutions to the issues met during the season? Dominique Méliand: There is no magic wand to make a competitive bike the ultimate weapon. It is always the result of research, development and testing that make the evolution of technology in racing field. We had a small problem caused by several problems related to a rise in temperature of the brakes. We had to identify all these problems together as some depend on each other and are therefore very linked. So yes, we have identified the problem and we are heading to Suzuki with several pieces to put on the front. These parts that should I think definitely solve these problems.